Various insulation products are used depending on the application. Below is a description of the advantages of each insulation product and which is the best product for each application. 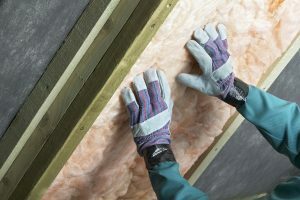 To help understand the descriptions, here is a good glossary of insulation terms. Closed-cell spray polyurethane foam insulation offers multiple advantages. It protects against conduction, radiant, convection, moisture accumulation, air intrusion and air infiltration. It achieves around R-7 per inch – the highest R-value per inch, allowing us the ability to reach required R-values in shallow cavities. Closed-cell addresses all six paths of heat gain and loss allowing for lower required R-values. It’s also a great air barrier, allowing us to insulate direct to the underside of the roof deck as per code and air seal framing cavities at vertical walls and sub floor. It’s a bulk water barrier applied in areas where insulation may come in direct contact with earth or water. It will act as a secondary water barrier under the roof deck during events such as hurricanes, protecting the interior of the home from water damage. As a vapor retarder, it has a dramatic effect on vapor’s ability to diffuse through the building envelope that could lead to major moisture issues. With a sound transmission class (STC) rating of 39, it’s very good at keeping sound pollution out of the building, but does not provide interior sound control. Also provides added structural strength. Adds a 300% increase to racking and uplift strength of a structure at three inches. It’s the only insulation approved by FEMA because of this and its bulk water barrier ability. Best applications include underside of roof deck, vertical walls, crawl space, wine coolers (3.5”), below grade and exterior side of envelope. As far as code requirements for closed-cell foam, most markets require R-21 at the underside of the roof deck; but it is necessary to verify locally. It does not require an ignition barrier but requires a thermal barrier if exposed to occupied or designed (structurally engineered) storage space. Closed-cell foam also requires a UV coating if exposed to direct sun light. This is the most widely used foam on the market. This installed insulation product protects against conduction, radiant, convection, moisture accumulation, air intrusion and air infiltration. It achieves R-3.5 per inch. It’s half the R-value of closed cell, with the same benefits as an insulator but poor ability against vapor. It achieves diffusion but no added structural strength. Due to standard framing cavity depths, very seldom is it unable to achieve the required R-values in vertical walls. It addresses all six paths of heat gain and loss allowing for lower required R-values. As an air barrier, open cell allows a contractor to insulate direct to the underside of the roof deck as per code and air seal framing cavities at vertical walls and sub floor. Sound transmission class – STC Rating 37. Very good at keeping sound pollution out of the building and good for interior sound control. Best applications: underside of roof deck, vertical walls, sound walls; Interior use only. Most markets require R-21 at the underside of the roof deck. Faced fiberglass batt insulation achieves approximately R-2.9 per inch and protects against conduction and moisture accumulation. 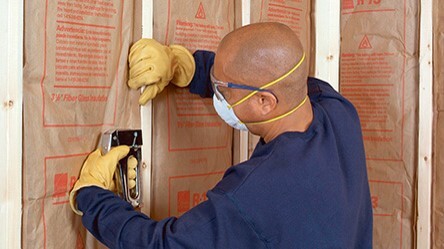 Faced insulation has paper on one side that acts as a Class II vapor retarder when installed facing the hot warm side during the winter months. It is most commonly used in vertical walls. The sound transmission class – STC Rating 39 that it gets is good for interior sound walls but less effective against noise pollution. Best applications are attic floor and exterior walls in Climate zones 5, 6 and 7; attic floor and exterior walls in Climate zones 1.2.3. The installation method for this insulation product is either friction fitted or stapled. Code requires no voids or gaps and paper to face the interior. 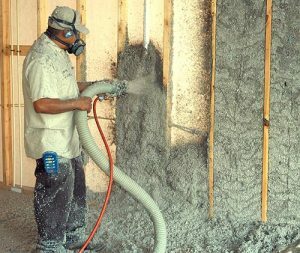 It can be used in conjunction with a hybrid system with foam sprayed to the substrate and fiberglass filling the remainder of the cavity, or with closed-cell foam on the exterior walls, with 1” foam in climate zones 1-3, 1.25” in climates zone 4-6, and in climate zone 7, the foam must make up 30% of the total R-value. This product achieves approximately R-2.9 per inch. It protects against conduction and is the most commonly used fiberglass batt in climate zones 1, 2 & 3 at exterior walls where vapor control is on the exterior side of the building. In attic application, it is generally used to insulate around tray ceilings, knee walls and sloped areas. Its sound transmission class (STC Rating 39) is good for interior sound walls but less effective than more against noise pollution. Best applications are the attic floor, exterior walls in Climate zones 1.2.3. In climate zones 4,5,6,7 when other insulation products installed on the interior side meet the vapor control requirements. The method of installation is friction-fitted. Code requires no voids or gaps and requires a vapor barrier on the interior side. Can be used in conjunction with other products for a hybrid system. For example, spray foam can be applied to the substrate and fiberglass filling the remainder of the cavity. If closed cell is used for the exterior walls, code requires 1” foam in climate zones 1-3, 1.25” climate zone 4-6, in climate zone 7, foam must make up 30% of the total R-value. Loose fill fiber protects against conduction and gets approximately R-2.5. It’s the most economical and widely used insulation in attics at the the attic floor in accessible, non-sloped areas. It has an STC rating of 39 and is good for interior sound walls but less effective than more against noise pollution. The best application is for attic floors in all climate zones. Loose fill is installed by blowing into flat sections of the attic floor. Code requires specified depths are achieved. If using in conjunction with other products, in a hybrid system, all climate zones 1” closed cell sprayed to attic floor with loose fill blown in over it. Loose fill cellulose gets approximately R-3.3 per inch and protects against conduction. 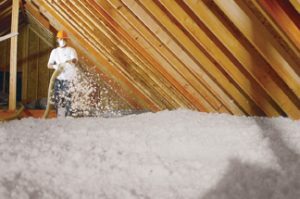 It is the most economical and widely used insulation in attics at the the attic floor in accessible non-sloped areas. 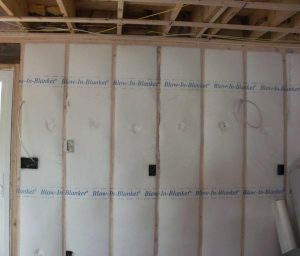 With loose fill cellulose, it’s necessary to check for areas that may not be accessible once drywall is hung requiring batts prior to drywall. Sound transmission class is STC Rating 39. Good for interior sound walls but less effective than more against noise pollution. Best application is attic floor in all climate zones. The best application is for attic floors in all climate zones. Loose fill is installed by blowing into flat sections of the attic floor. Code requires specified depths are achieved with this insulation product. If using in conjunction with other products, in a hybrid system, all climate zones 1” closed cell sprayed to attic floor with loose fill blown in over it. This is a nice conventional insulation solution. BIBS achieve approximately R-4.2 per inch and protects against conduction. Bibs are applied at exterior walls, fully filling the cavity and held in place by netting. This application may, in some applications, be better than batt insulation in filling all gaps around outlets, plumbing and other obstacles. Sound transmission class STC Rating 49. Great against noise pollution. Best applications are exterior walls in Climate zones 1.2.3. In climate zones 4,5,6,7 when other products installed on the interior side meet the vapor control code requirements. Installation method is a thick mesh netting that is stapled in place along all exterior, penetrations are then made to allow the insulation to be pumped into the cavity behind the netting. Code requires specified depths to be achieved and no voids or gaps. Can be used in conjunction with foam sprayed to the substrate and bibs filling the remainder of the cavity. This insulation product is a very slight step down in performance from BIBS. It gets approximately R-3.8 per inch and protects against conduction. Wet Spray Cellulose is applied at exterior walls, full filling the cavity and held in place by an adhesive. This application fills all gaps around outlets, plumbing and other obstacles. Sound transmission class STC Rating 49. Great against noise pollution. The best application would be exterior walls in Climate zones 1.2.3. In climate zones 4,5,6,7, when other products installed on the interior side, will meet the vapor control requirements. It’s installed by spraying into place. It’s necessary to understand the various requirements in choosing an insulation product. Each solution has its own advantages. One common area of concern is exterior vertical walls. 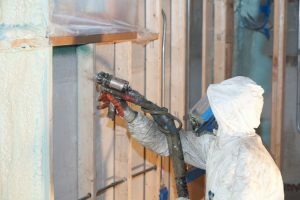 In that application, closed-cell spray foam might be the best solution given its multiple advantages and high R-value. For sound control, another common area of interest for builders, closed-cell or open-cell (un-vented attic assembly) should be considered for exterior walls. For interior wall sound control, the best application might be mineral fiber, followed by BIBS/wet spray cellulose (drywall hung one side prior to install). Sound control between floors is best solved with an application of open-cell spray foam or mineral wool batts. 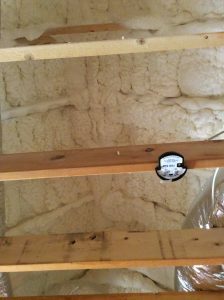 Finally, for vapor control in an attic application, closed-cell spray foam is usually the recommended solution.